Tuesday, 20th/21th June: 300 m depth passed. Once again a warm, sunny day. In the 'morning' at 6 PM, when we begin our work in the drill tent, temperatures are just at the freezing point. When we cut the ice with the saw, we produce water instead of ice chips, and our samples stick to the processing table. After a couple of hours it gets cooler and for the rest of the day it is -2 to -3 C in the tent. When we end our working day in the 'evening'at 10 AM it's melting point temperatures again. Tha cable spooling on our winch is now so bad that we have decided to cut away 250 m off the length. Steff and Sverir did so, and after dinner we started to drill again. While the winch was being repaired Lars, Bo and Namcy went 1.3 km North of camp to perform a 2.8 m pit study. they took 5 cm profiles for chemistry and sotopes. Dinner was paella prepared by Dorthe. Weather. 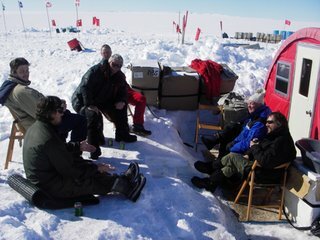 Fine, winds up to 2 m/s from N, temperatures -5 to -1 C.
Monday, 19th/20th June: It gets a little too warm..
A moment of rest in front of the kitchen tent. cable spooling is teasing us because the winch drum deforms, and we had to unwind and rewind the cable twice today. 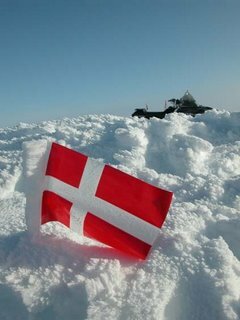 Weather: Fine, wind 2 m/s from S and temperatures -3 to -1 C.
Sunday, 18th/19th June. Nice and quiet Sunday. We woke up to a sunny day with erverything covered by frost. 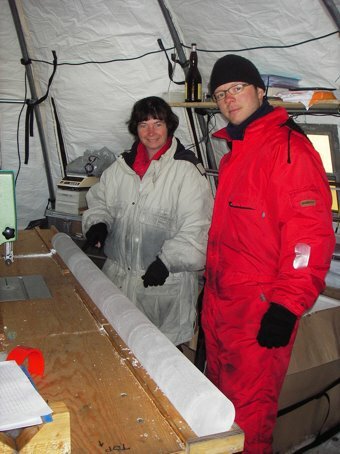 Work started slowly and we drilled and processed 19.31 m ice core during the day. Sunday is always a quiet and rather uneventful day, so for today we have no stories to offer. Weather: Fine, winds up to 3 m/s from S, temperatures: -7 to -5 C.
Saturday, 17th June. Not a day without incidents.. The camp is still sitting in cloud. Frost is covering everything and we have little wind today. 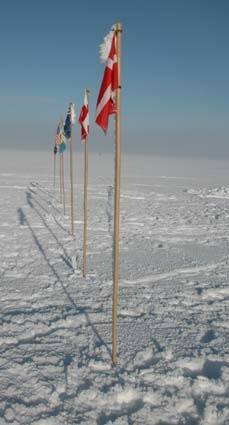 We have now filled all empty foamboxes in camp with ice cores, and we need 10-15 more foamboxes for the rest of the planned drilling. We spent some time today converting the pit excavated for science into a food freezer. 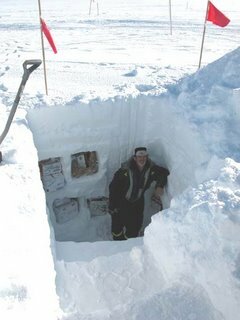 All frozen food boxes were excavated, and the food placed on shelves in the pit. The pit has been covered with a tent since we are out of plywood in camp. We monitor the temperature in the pit. The morning shift had a good start but after 3 hours the achor for the spring support of the drill tower broke as the tower was tilted to horizontal position. Parts flew 20 m out of the tent but luckily no one was hurt. Steff and Sverrir spent the rest of their shift repairing the damage. And they were successful! We managed to drill 8.37 m to 247.52m. And then it was Saturday "night". Everybody got dressed for the occation. We put table cloth and candles on the table. We put blinds on the windows to create a nice warm and "red" evening atmosphere. The menu was composed by team2 (Steff, Sverrir, Thorsteinn, Dorthe and Bo) and it consisted of a tropical drink (lemonade with rum and snow), chilli shrimps, roast with fresh asparagus rolled up in bacon and ice cream with strawberries. We had a nice Saturday night with some dancing and games of dice called "Meyer". Weather: Overcast with winds up to 5 m/s from S and temperatures -7 to -4 C.